Going shoe shopping soon? Here is a Chart Template to help you avoid the annoyance and embarrassment of getting the wrong shoe sizes. These are also helpful references for those who buy the majority of their clothes and shoes through online shopping networks. Maybe you know your shoe size but you’re buying for your child, whose feet seem to be growing inches every month. 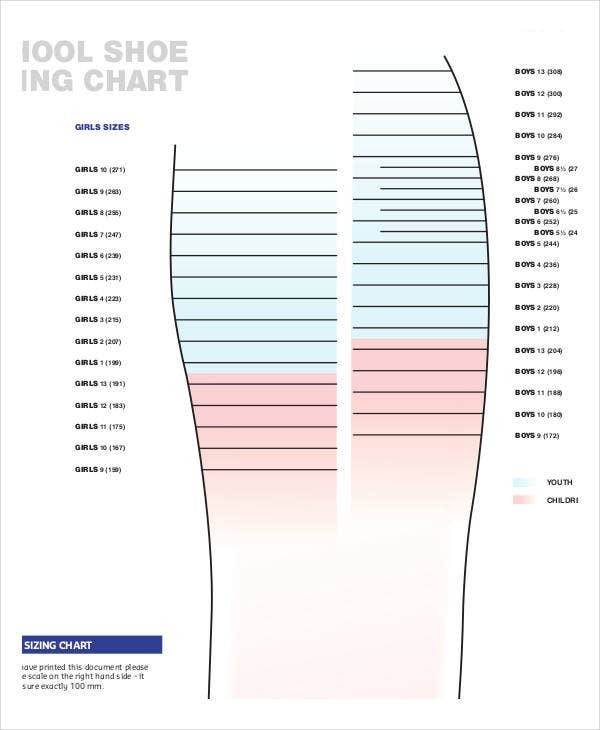 With these charts you’ll be able to measure shoe sizes from home. Many shoe stores will have their own foot-measuring equipment, but not all do. (Do you own or run a shoe store? You’ll need these just as much.) 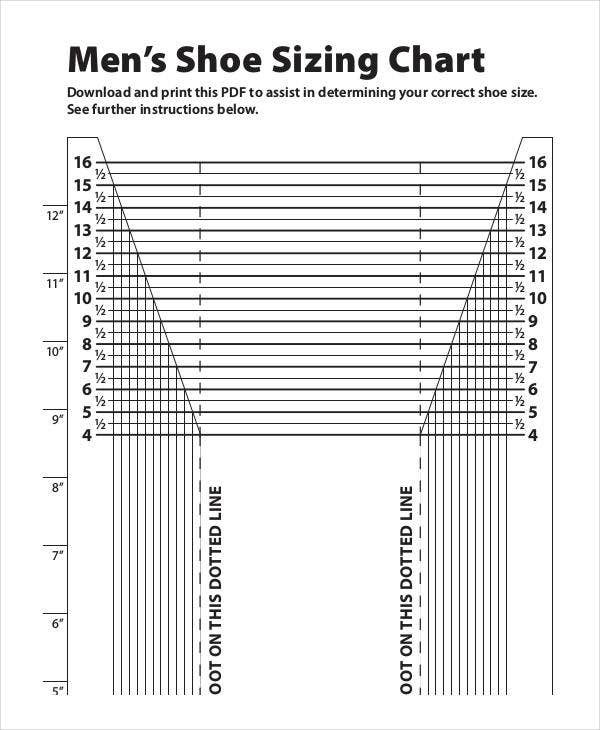 You never have to be at a loss or send back the wrong size shoes once you get these printable shoe size charts. 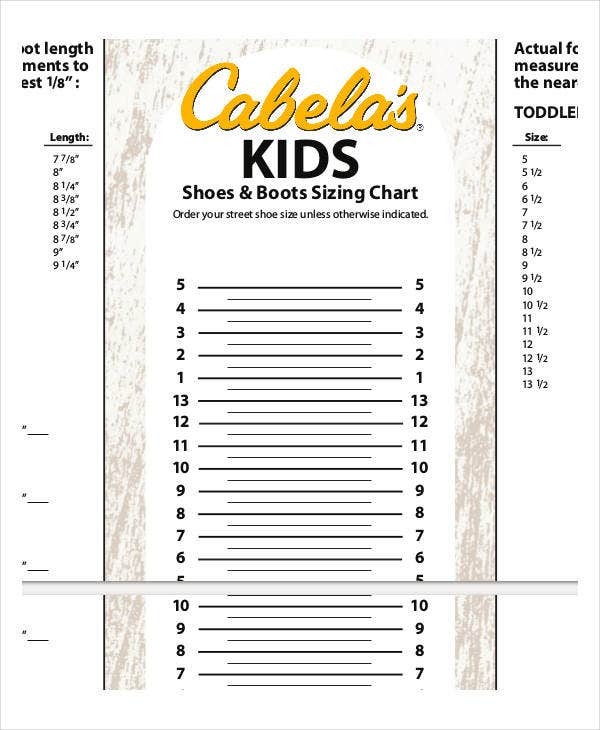 Print out these charts and bring them with you on your next shopping spree with your young ones in tow. 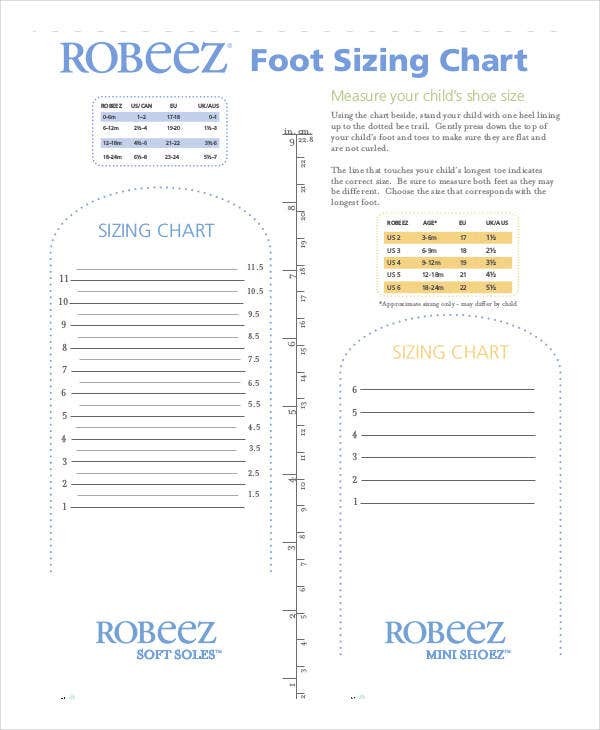 The Printable Child Shoe Size Chart from Robeez allows you to measure your child’s foot by standing them on the chart and lining up their heel on the dotted bee line. What if your child is too young to even crawl, much less stand on a chart? 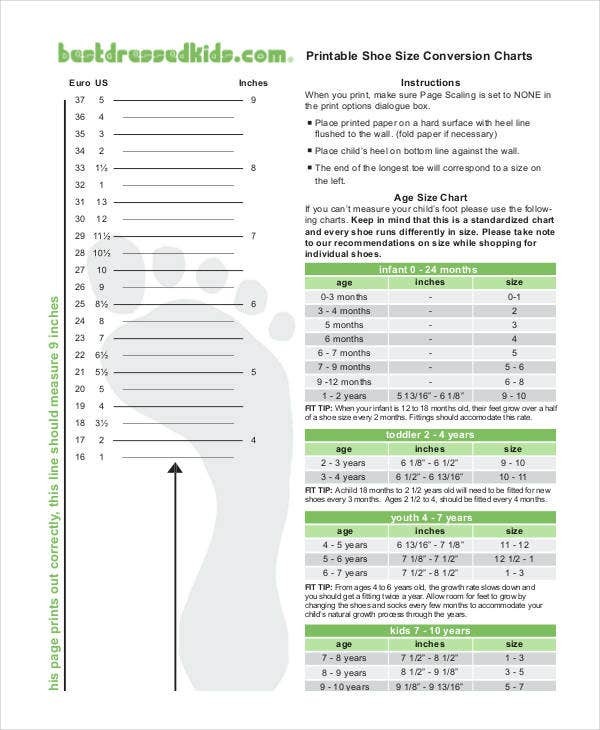 The Printable Newborn Shoe Size Chart will help you when they are less than 3 months old (also includes details for older children). 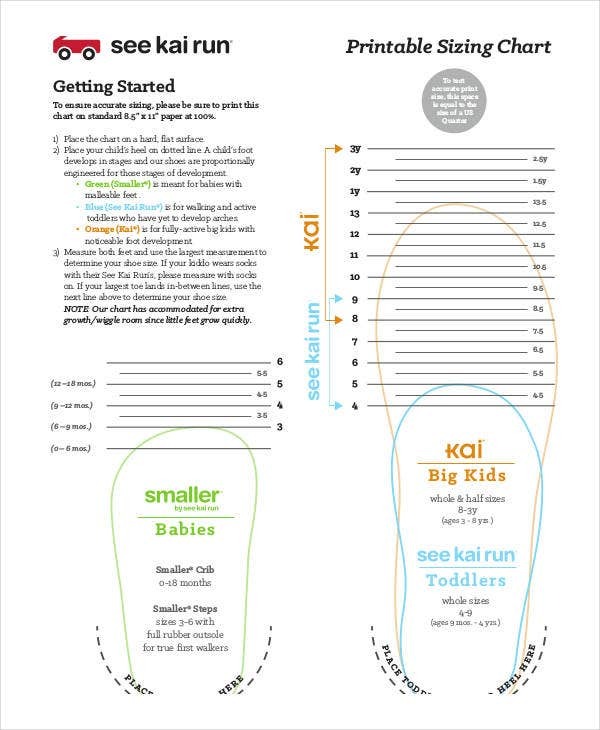 Also see Printable Baby Shoe Size Chart and all the other options below. 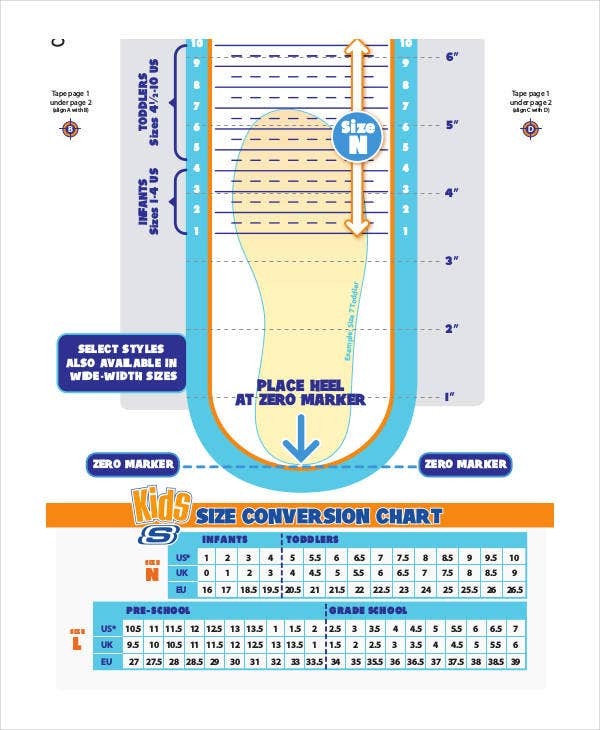 The Printable Toddler Shoe Size Chart will allow you to even convert your infant’s or child’s shoe size to the US, UK, and European size standards. Use an Excel Chart Template to record the whole family’s shoe sizes. Next time you go shoe shopping for the whole troupe, you won’t get anything wrong. For awestruck parents tracking their children’s growth spurts, record their sizes on a Control Chart Template. It will make a good family reunion ice-breaker story. Thinking of buying that perfect pair of shoes for your loved one? Perhaps it is an anniversary gift for your spouse or a birthday gift for your parents. Or perhaps you’re buying for yourself. 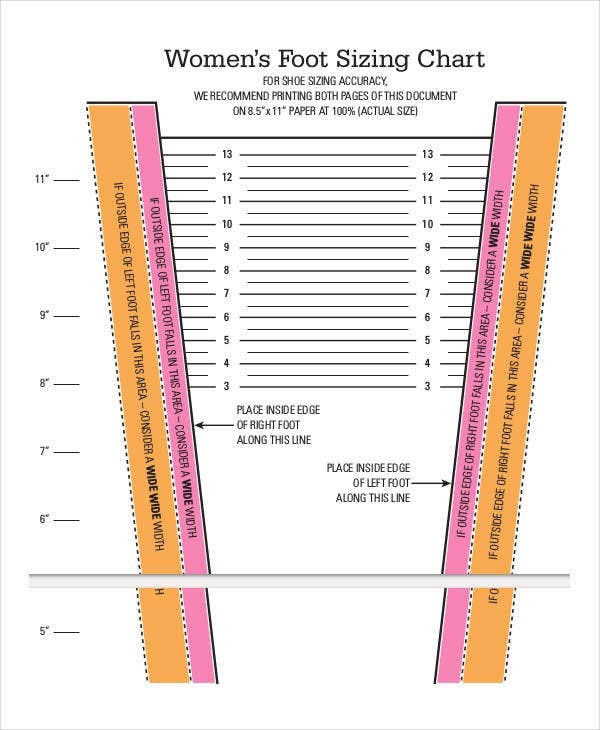 Use the Printable Women’s Shoe Size Chart, recommended to be printed out in two A4 (8.5″ × 11″) pages for higher accuracy—don’t skimp on accuracy especially when buying heels! Nothing says “savvy shopper” more than a person who knows their shoe size down to the toe and in any sizing standard. 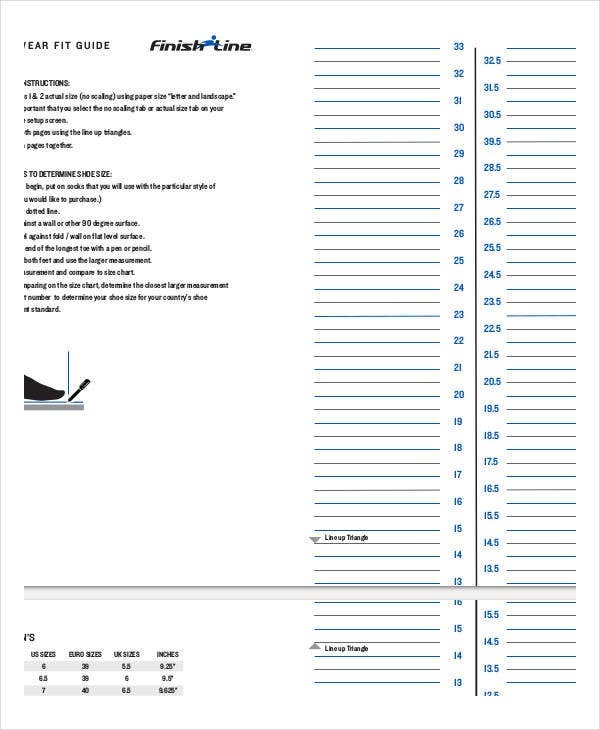 For convenience, every chart in this collection is available to download as free PDF files with all basic features you’ll need. 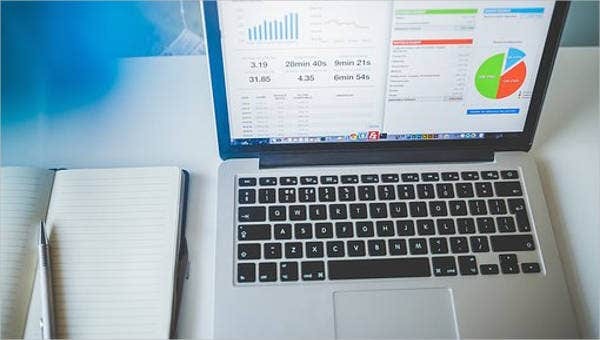 Whether you are a shopper or a shopkeeper, you’ll find the information and layouts of these charts instantly useful. Remember to laminate them if you’re going to have people stepping on them a lot. Your child is growing—and not just the feet. 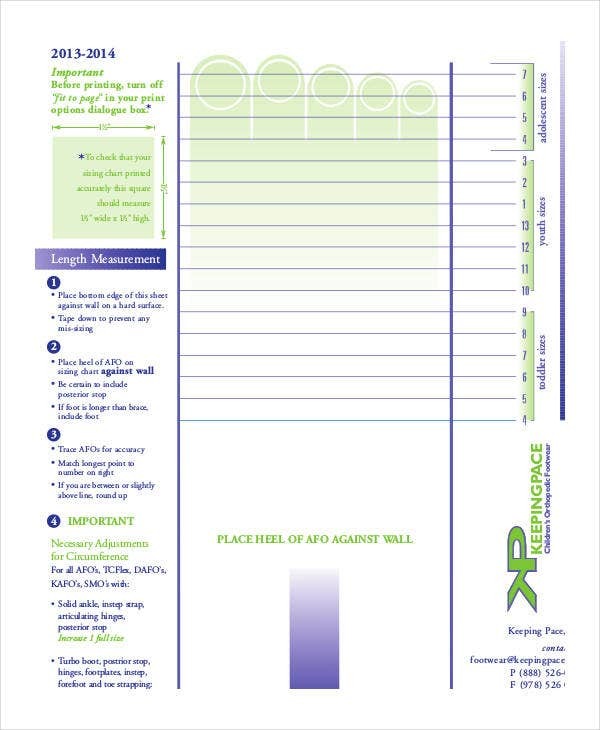 Use a Baby Growth Chart Template to monitor and document your baby’s development. Next time someone says, “How have they grown so fast!” you’ll be able to provide visual demonstration. Great party topic right there.